If there were such a thing as a blogger crush, I have a pretty serious one. Sweet Fine Day has been one of my MOST favorite blogs to keep up with (except the mecca Design*Sponge), for years now. I read every single post, and I would even go as far to say, she is one of the women who inspired me to start StellaBella to begin with! That and the movie, Julie & Julia. 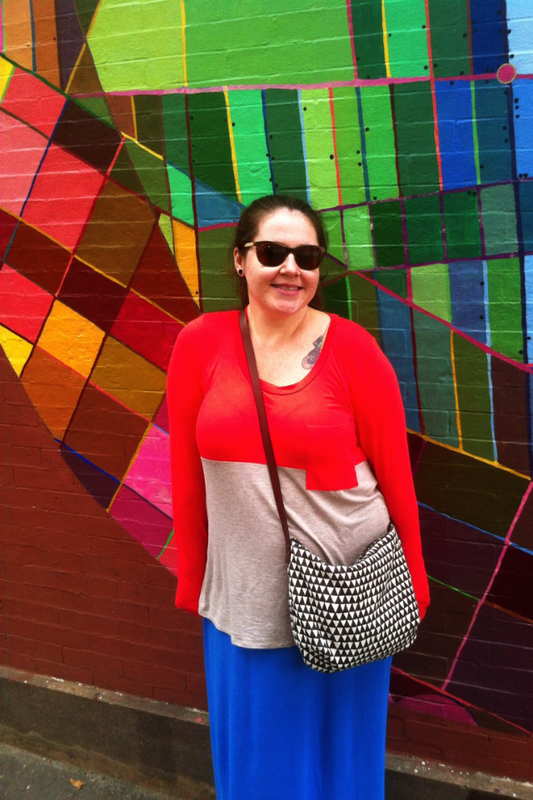 Jenna Park is a Park Slope designer, photographer and co-owner of another great local business; Whimsey & Spice with her husband, Mark. Her blog, Sweet Fine Day is her visual journal of 2 self employed entrepreneurs, juggling family life in NYC. Not only is she an amazing photographer, her photos capture the honestly and truth that is accompanied by the candor of her beautifully poetic writing style. 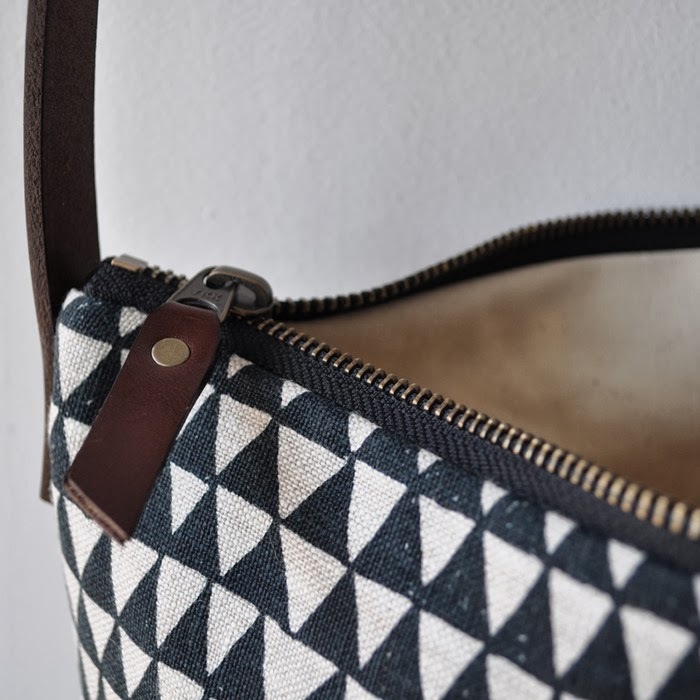 This past Fall, Jenna talked about an Etsy shop that she frequents, and showed the smart looking tote she recently purchased from this hand-made shop. If it was up her aesthetic alley, I wanted to check it out for myself. Bookhou is an online shop here and on Etsy, cofounded by John Booth, Queens University and architecture degree from University of Toronto, and Arounna Khounnoraj, Ontario College of Art, Nova Scotia College of Art and Design and MFA from University of Waterloo. They bring their talents together through Bookhou to showcase their individual and collaborative work. 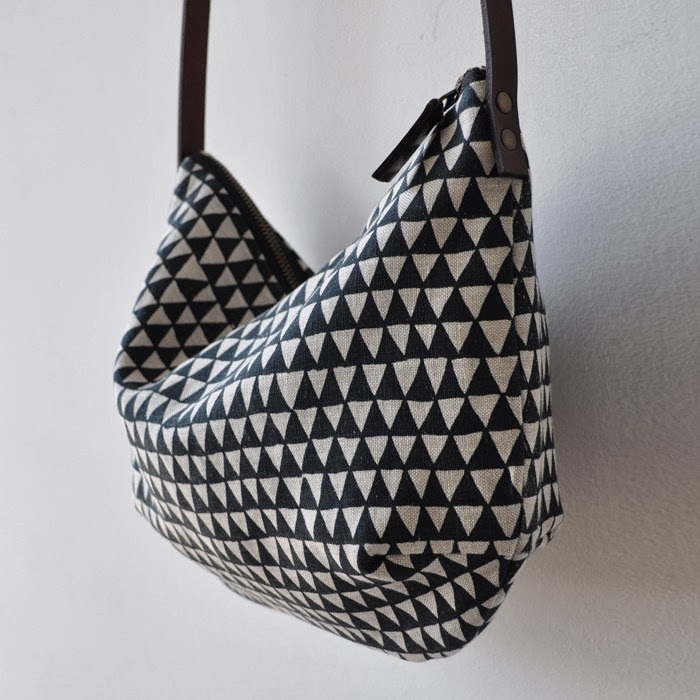 They are a multidisciplinary studio that emphasizes natural handmade materials and small production pieces. In the fall of 2008 they opened their brick & mortar shop located on Dundas Street West in Toronto, Canada. If you ever find yourself in this beautiful northern city, stop in! But, if not... order away at the click of a button - you will still get a personal touch! 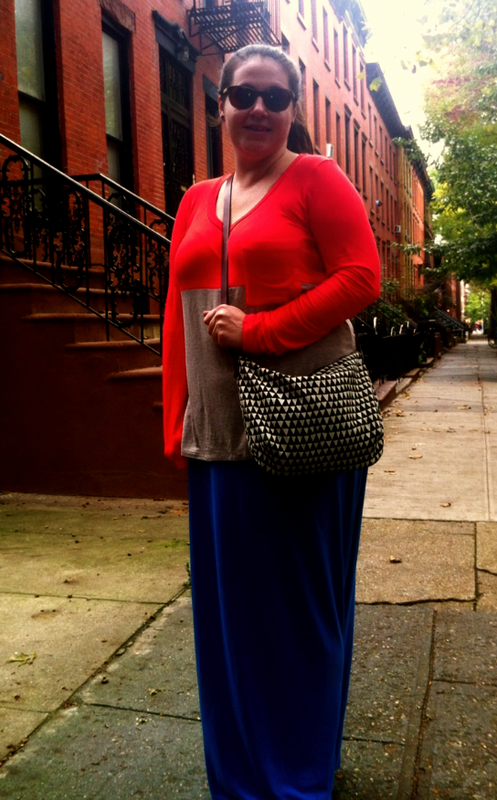 I ended up purchasing this great sachel, which I was very proud of because, I always am swayed by an over-sized tote. They have so many great sizes and prints to choose from, but this one is great for just the essentials on your casual day. 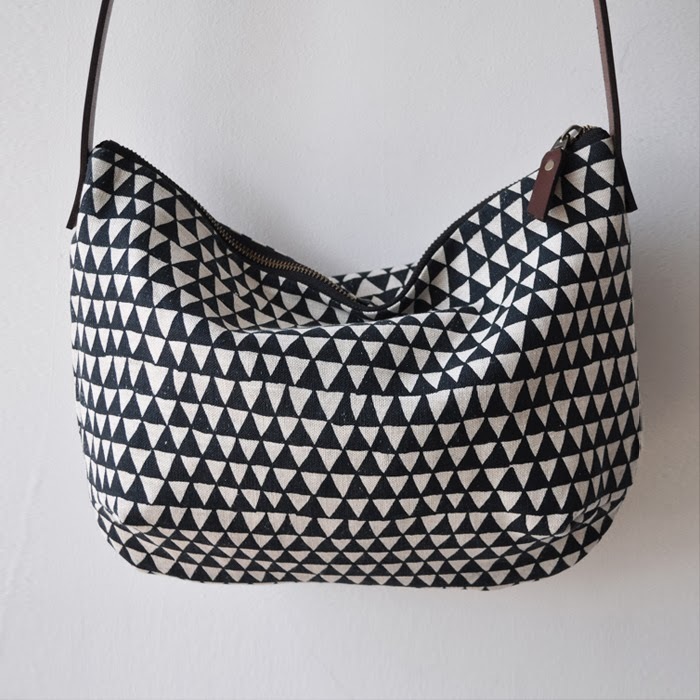 This triangle pattern is printed in black solvent free ink on both sides, 100% linen, with organic cotton twill lining. The zipper is antique brass w/ a leather zipper pull & veg tan bridle leather strap. The thing I love about connecting with small business through the web, is the personal touch they still embrace. 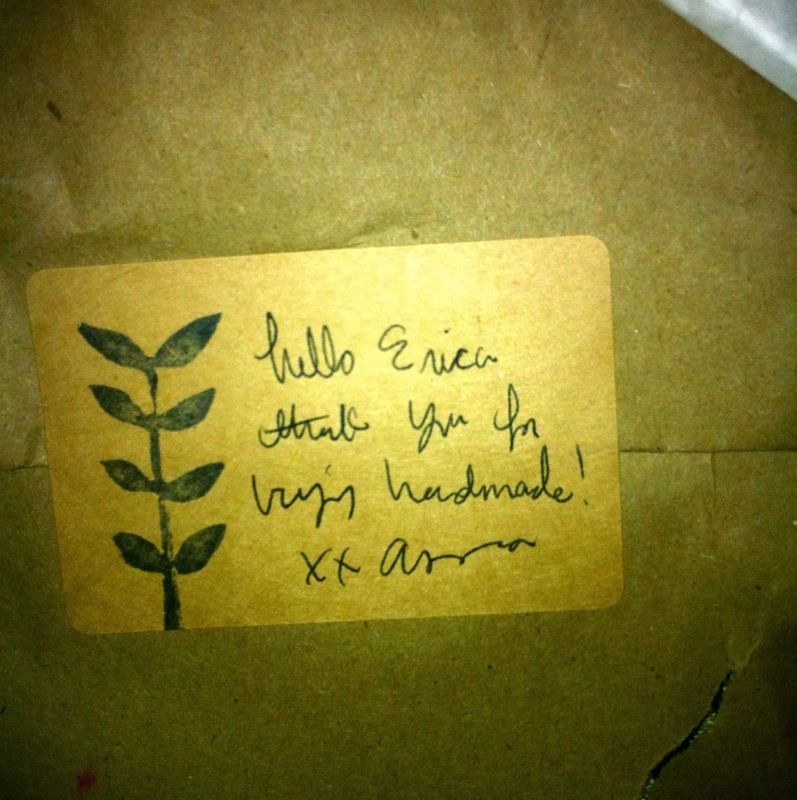 The purse was wrapped delicately in tissue with the most adorable hand printed sticker - "Erica, Thank you for buying handmade! xoxo Arounna"
You're Welcome Arounna - I love the bag!